So because of Winnipeg's "awesome" concert promoter Dream Theater was actually cut from the June 30th Winnipeg show. Upon hearing this I talked it over with my friends and we all decided to get tickets for the June 29th Saskatoon show which is only an 8 hour drive north west from here. Nothing like a good ol road trip to go see two of the greatest bands on one bill! But why was Dream Theater cut from the show? The promoter arranged for a local act to open for Maiden instead. I think there was a battle of the bands type contest going on in the local rock/metal scene to decide who gets the once-in-a-lifetime opportunity. But it's not like they couldn't allow both the local band and Dream Theater to open. I guess that's a little too complicated. At any rate we got our floor tickets for Saskatoon and left bright and early yesterday morning to get to the show on time. The road trip was relatively uneventful so I won't bore you with too many details. We had great weather all the way to the show, but the car I was riding in did not have AC so I was sweating buckets for most of the ride there. All the sweat caused me to fry the screen in my phone which also doubles as my 8.1 mega pixel camera. Still not really impressed about that. But, we made it to the venue safe and sound with plenty of time to spare. It was my first and most likely last time going to the Credit Union Centre. The venue looks big on the outside, but it's pretty small. I'd say you'd only be able to get 10,000 people in there, and they were no where close to that for the show last night. Guess they don't have a lot of Maiden fans out that way. Dream Theater hit the stage just after 7:00 local time. They opened their set with As I Am which set the mood for the rest of the show; fast and aggressive. This was my fourth time since 2007 and each show has been in four different cities. They sounded great and didn’t take a lot of pauses between songs. Because they were opening they didn’t have time to show off their gadgets. Unfortunately for Rudess and Petrucci the crowd wasn’t able to see all of the crazy techniques they use, but they could still hear the madness. My friends and I spotted a few concert goers with Dream Theater shirts but it didn’t really seem like anyone knew who they were. I think they won over a few new fans last night with their setlist. They played As I Am, A Right of Passage, Home, Constant Motion, Panic Attack, and Pull Me Under but don't expect them to do the same if they roll through your town. And now the moment you've all been waiting for....... IRON MAIDEN! This is my second time seeing these guys. I was lucky enough to see them on their Somewhere Back In Time tour where they delighted audiences with material from the 80's. Going into the show I anticipated that they would shy away from those songs and play some of their newer stuff since they're out supporting their upcoming album. I've only had a chance to hear El Dorado from the new album and since I'm a Maiden die-hard fan I'm not picky as to what I want to hear at one of their shows. Their set this time has a lot of laser lights, planets and general space scenery so I could only assume that their new record will have a space theme of some sort. I'm looking forward to giving it a listen on August 17th. Starting with Wicker Man, Bruce instantly gets the crowd to sing along with him and we're off to the races. 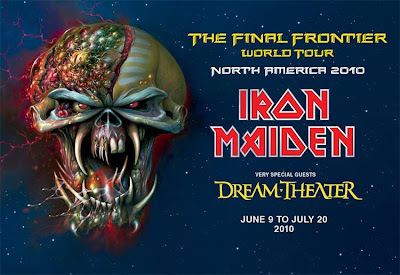 Most of the songs they played were from the last four albums (Brave New World, Dance of Death, A Matter of Life and Death and The Final Frontier) with a few older tunes (like Wrathchild and Running Free!) thrown in for good measure. I dig the new Maiden stuff, but I just don’t know it as well as the older tunes (save for Brave New World, that album is amazing). So I didn’t know the crowd queues from Bruce and I don't know all of the lyrics but thankfully you should have a good idea on what you're supposed to be yelling out by the second chorus. Despite this hangup I enjoyed the hell out of that show. 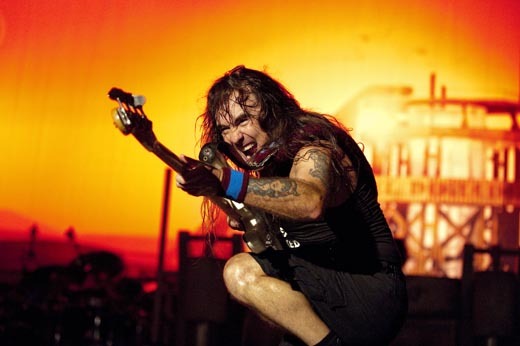 Hearing the Brave New World tunes again was awesome and seeing Eddie come out and fight with the band never gets old. SO GOOD! If you haven't got a ticket for this show yet, and the concert hasn't sold out in your city yet you should really do yourself a solid and buy a ticket already. This show will be one to remember for a long time and it's always good to get out and see some great metal whenever you can. If you have never had the chance to see Dream Theater and you were thinking about going to the show late, I highly recommend that you change your mind. These guys are easily considered to be the some of the best musicians in the business and they showcase it with every show.